Conversations across software engineering forums sometimes reveal unexpected views, as it’s the case for the benefits of accountability. One would assume that competition would impel enterprises to scrutiny with regard to resources employed and product outcomes, pushing for the assessment of internal activities based on some agreed metrics. And yet, now and again, software development is viewed as a boutique occupation, if not an art pursuit, carried out by creative craftsmen for enlightened if demanding patrons; a vocation too distinctive to be gauged by common yardsticks. Setting apart creative delusions, the assessment of software development is effectively confronted with rational as well as practical obstacles. To begin with rationality, and unlike traditional products, there is no market pricing mechanism that could match software development costs with customers’ value. As a consequence business stakeholders and systems engineers prefer to play safe and keep their respective assessments on the opposed banks of the customer/provider divide. As for the practicality of assessments, the choice is between idiosyncratic approaches (e.g users’ points) and reasoned ones (essentially function points). The former ones being by nature specific and subject to changes in business opportunities, whereas the latter ones are being plagued by implementation plights that make them both costly and unreliable. Yet, the diluting of IT systems in business environments is making that conundrum irrelevant: the fusing of business processes and supporting software is blanketing the discontinuities between business value and development costs. Given the digital integration between systems and business environments and the part played by software in production, marketing and operations, enterprises can no longer ignore the economics of software development. As far as enterprises are concerned, economics use prices for two key purposes, external and internal. With regard to their business environment, enterprises need metrics to price the resources they could buy and the products they could sell; their competitive edge fully depends on the thoroughness and accuracy of both. Confronted to continuous, frequent, and often abrupt changes in business environments, enterprise must be able to adapt their activities without having to change its architectures. That cannot be achieved without timely and accurate assessments of the way their resources are put to use. Conversely, enterprises may have to change their architectures without affecting their performances; that cannot be achieved without a comprehensive and accurate assessments of alternative options, organizational as well as technical. To summarize, the spread and intricacy of software footprint over both sides of the crumbling fences between enterprise systems and business environments makes software economics a necessary component of enterprises governance, so a tally of software beans should not be an option. As far as systems engineering is concerned, the aim of a feasibility study is to verify that a business solution can be supported by a system architecture (requirements feasibility) subject to some agreed technical and budgetary constraints (engineering feasibility). A feasibility study is based on the implicit assumption of slack architecture capabilities. But since capabilities are set with regard to several dimensions, architectures boundaries cannot be taken for granted and decisions may even entail some arbitrage between business requirements and engineering constraints. Focusing on system functionalities (e.g with use cases) implies that system boundaries are already identified and that the business logic will be defined along with users’ interfaces. Starting with business requirements puts business domains and logic on the driving seat, making room for variations in system functionalities and boundaries . Operational requirements (physical environments, events, and processes execution) put the emphasis on a mix of business processes and quality of service, thus making software functionalities a dependent variable. In any case a distinction should be made between requirements and engineering feasibility, the former set with regard to architecture capabilities, the latter with regard to development resources and budget constraints. Security (entry points) and confidentiality (domains). Compliance with regulatory constraints (domains) and flexibility (activities). Reliability (processes) and interoperability (locations). Feasible options could then be figured out by points set within the capabilities pentagon. Given metrics on functional requirements, their feasibility under the non functional constraints could be assessed with regard to cross capabilities. And since the same five core capabilities can be consistently defined across enterprise, systems, and platforms layers, requirements feasibility could be assessed without prejudging architecture decisions. One step further, the feasibility of business and operational objectives (the “Why” of the Zachman framework) can be more easily assessed if set on the outer range and mapped to architecture capabilities. Finally, the feasibility of business and functional requirements under the constraints set by non functional requirements has to be translated in terms of ROI, and for that purpose the business value has to be compared to the cost of engineering the solution given the resources (people and tools), technical requirements, and budgetary constraints. ROI assessment mapping business value against functionalities, engineering outlays, and operational costs. That where the transparency and traceability of capabilities across layers may be especially useful when alternatives and priorities are to be considered mixing functionalities, engineering outlays, and operational costs. Software engineering models can be regrouped in two categories depending on their target: analysis models represent business context and concerns, design ones represent systems components. Whatever the terminologies, all models are to be verified with regard to their intrinsic qualities, and validated with regard to their domain of discourse, respectively business objects and activities (analysis models), or software artifacts (design models). Checking for internal consistency is arguably straightforward as proofs can be built with regard to the syntax and semantics of modeling (or programming) languages. Things are more complicated for external consistency because hypothetical proofs would have to rely on what is known of the business domains, whose knowledge is by nature partial and specific, if not hypothetical. Nonetheless, even if general proofs are out of reach, the truth of models can still be disproved by counter examples found among the instances under consideration. With regard to systems engineering, domains of discourse cover artifacts which are, by “construct”, fully defined. Conversely, with regard to business context and objectives, domains of discourse have to deal with instances whose definitions are a “work in progress”. That can be illustrated by analysis models, which are meant to translate requirements into system functionalities, as opposed to design ones, which specify the corresponding software artifacts. Since software artifacts are supposed to be built from designs, checking the consistency of the mapping is arguably a straightforward undertaking. That’s not the case when the consistency of analysis models has to be checked against objects and activities identified by business’ domains of discourse, possibly with partial, ambiguous, or conflicting descriptions. For that purpose some logic may help. Business requirements describe objects, events, and activities, and the purpose of modeling is to identify those instances and regroup them into subsets built according to their features and relationships. Rental cars are exclusively and definitively partitioned according to models (mxf). 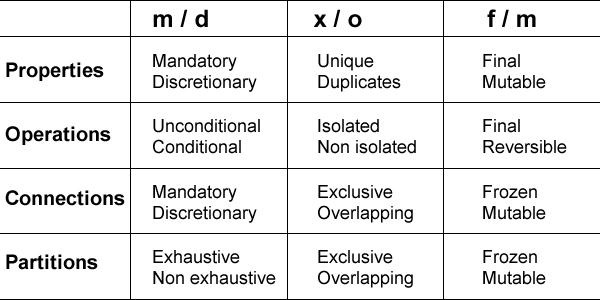 Models are exclusively partitioned according to rental group (mxm), and exclusively and definitively according body style (mxf). 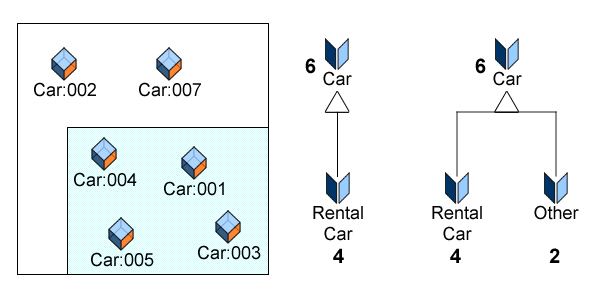 Rental cars are partitioned by derivation (/) according to group and body style. Such models are deemed to be consistent if all instances are consistently taken into account. 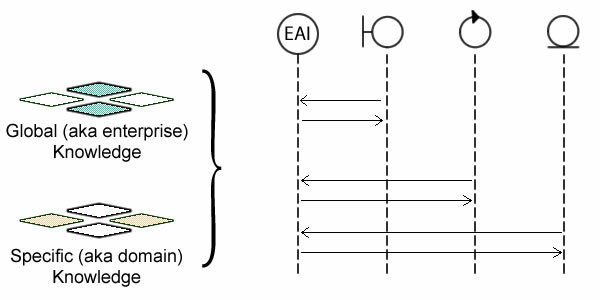 Assuming that models backbone can be expressed logically, their consistency can be formally verified using a logical language, e.g Prolog. connect(220, manufacturer_, carModel, manufacturer, mof). 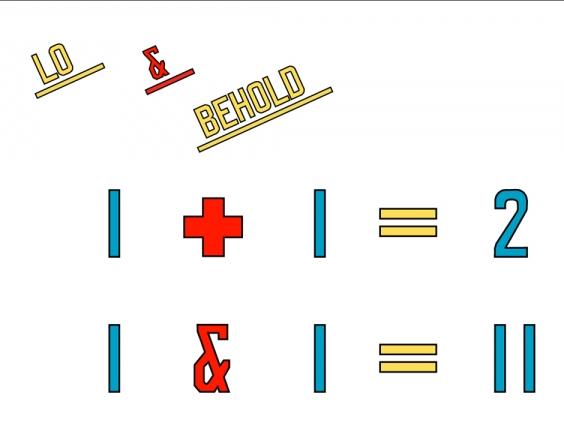 All instances are taken into account: there is no instance N without instance(N,Structure). Logical consistency: there is no instance N with conflicting partitioning (native and derived). Completeness: there is no instance type(X,N,T(f1,f2,..)) with undefined feature fi. Functional consistency: there is no instance of relation R (native and derived) without a consistent type relation(X, R, Origin, Destination, Epistemic) . It must be noted that the approach is not limited to objects and is meant to encompass the whole scope of requirements: actual objects, symbolic representations, business logic, and processes execution. Flat models fall short when specific features are to be added to the elements of partitions subsets, and in that case sub-types must be introduced. 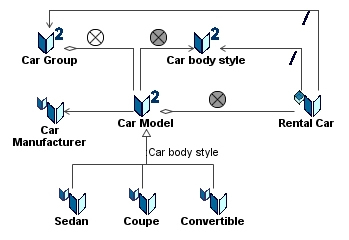 Yet, and contrary to partitions, sub-types come with abstractions: set within a flat model (i.e without sub-types), Car model fully describes all instances, but when sub-types sedan, coupe, and convertible are introduced, the Car model base type is nothing more than a partial (hence abstract) description. From partition to sub-types: subsets descriptions are supplemented with specific features. Whereas that difference may seem academic, it has direct and practical consequences when validation is considered because consistency must then be checked for every level, concrete or abstract. As it happens, the corresponding problem has been tackled by Barbara Liskov for software design: the so-called Liskov substitution principle (LSP) states that if S is a sub-type of T, then instances of T may be replaced with instances of S without altering any of the desirable properties of the program. Translated to analysis models, the principle would state that, given a set of instances, a model must keep its consistency independently of the level of abstraction considered. As a corollary, and assuming a model abides by the substitution principle, it would be possible to generalize the external consistency of a detailed level to the whole model whatever the level of abstraction. Hence the importance of compliance with the substitution principle when introducing sub-types in analysis models. Abstraction is arguably the essence of requirements modeling as its purpose is to bring specific and changing concerns under a common, consistent, and lasting conceptual roof. Yet, the two associated operations of specialization and generalization often receive very little scrutiny despite the fact that most of the related pitfalls can be avoided if the introduction of sub-types (i.e levels of abstraction) is explicitly justified by partitions. And that can be achieved by the substitution principle. Discretionary (or conditional or non exhaustive) partitions (d__) may bring about more instances for the base type (nb >= ∑nbi). Overlapping (or duplicate or non isolated) partitions (_o_) may bring about less instances for the base type (nb <= ∑nbi). Assuming specific features, mutable (or reversible) partitions (__m) means that features may differ between level; otherwise (same features) sub-types are not necessary. The logical interpreter could then be used to map the sub-types to partitions and check for substitution. Contrary to its manufacturing cousin, a long time devotee of preventive policies, software engineering is still ambivalent regarding the benefits of integrating quality management with development itself. That certainly should raise some questions, as one would expect the quality of symbolic artifacts to be much easier to manage than the one of their physical counterparts, if for no other reason than the former has to check symbolic outcomes against symbolic specifications while the latter must also to overcome the contingencies of non symbolic artifacts. Thanks to agile approaches, lessons from manufacturing are progressively learned, with lean and just-in-time principles making tentative inroads into software engineering. Taking advantage of the homogeneity of symbolic development flows, agile methods have forsaken phased processes in favor of iterative ones, making a priority of continuous and value driven deliveries to business users. Instead of predefined sequences of dedicated tasks, products are developed through iterations regrouping definition, building, and acceptance into the same cycles. That push differentiated documentation and models on back seats and may also introduce a new paradigm by putting tests on driving ones. Traditional (aka phased) processes follow a corrective strategy: tests are performed according a Last In First Out (LIFO) framework, for components (unit tests), system (integration), and business (acceptance). As a consequence, faults in functional architecture risk being identified after components completion, and flaws in organization and business processes may not emerge before the integration of system functionalities. In other words, the faults with the more wide-ranging consequences may be the last to be detected. 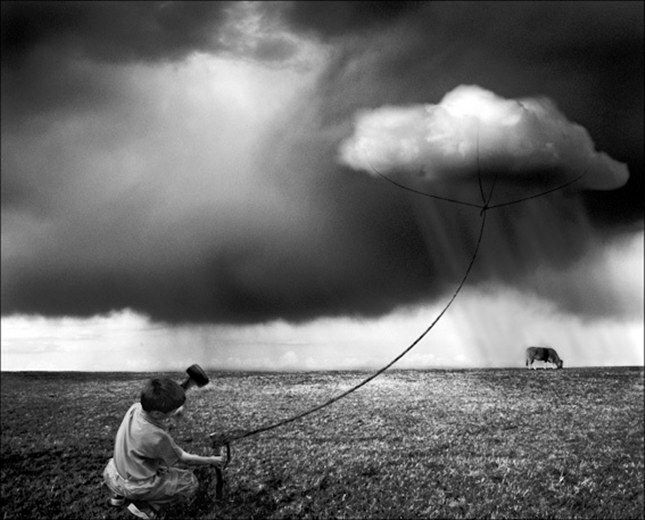 Iterative approaches follow a preemptive strategy: the sooner artifacts are tested, the better. 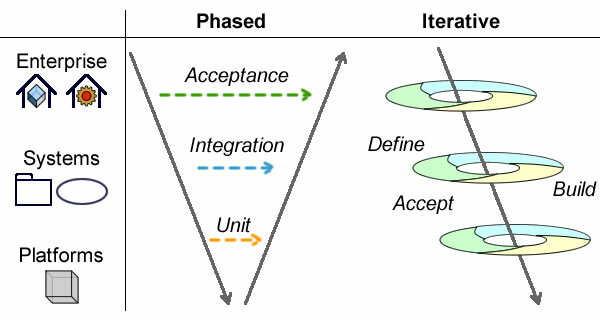 The downside is that without differentiated and phased objectives, there is a question mark on the kind of specifications against which software products are to be tested; likewise, the question is how results are to be managed across iteration cycles, especially if changing requirements are to be taken into account. 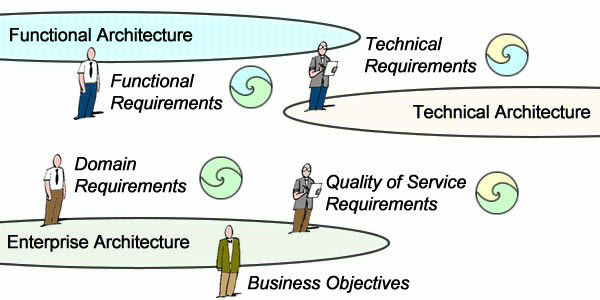 Looking for answers, one should first consider how requirements taxonomy can support tests management. 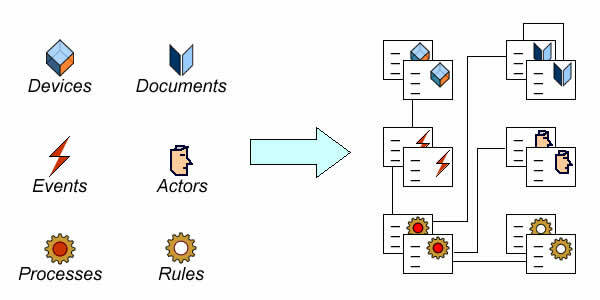 Whatever the methods or forms (users’ stories, use case, functional specifications, etc), requirements are meant to describe what is expected from systems, and as such they have two main purposes: (1) to serve as a reference for architects and engineers in software design and (2) to serve as a reference for tests and acceptance. With regard to those purposes, phased development models have been providing clearly defined steps (e.g requirements, analysis, design, implementation) and corresponding responsibilities. But when iterative cycles are applied to progressively refined requirements, those “facilities” are no longer available. Nonetheless, since tests and acceptance are still to be performed, a requirements taxonomy may replace phased steps as a testing framework. With regard to contents, requirements must be classified depending on who’s to decide: business and functional requirements are driven by users’ value and directly contribute to business experience; non functional requirements are driven by technical considerations. Overlapping concerns are usually regrouped as quality of service. Requirements with regard to Acceptance. That distinction between business and architecture driven requirements is at the root of portfolio management: projects with specific business stakeholders are best developed with the agile development model, architecture driven projects set across business domains may call for phased schemes. Units and component tests (Q1) cover technical requirements and can be performed on development artifacts independently of their functionalities. Functional tests (Q2) deal with system functionalities as expressed by users (e.g with stories or use cases), independently of operational or technical considerations. System acceptance tests (Q3) verify that those functionalities, when performed at enterprise level, effectively support business processes. System qualities tests (Q4) verify that those functionalities, when performed at enterprise level, are supported by architecture capabilities. 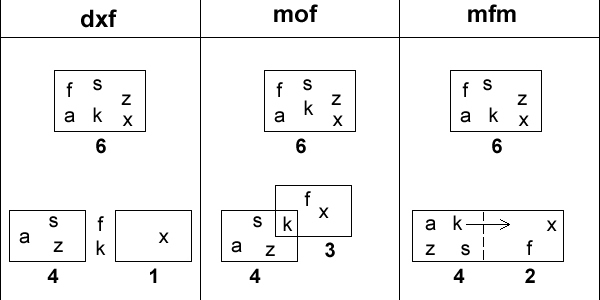 Tests Matrix for target and MO (adapted from D. Leffingwell). 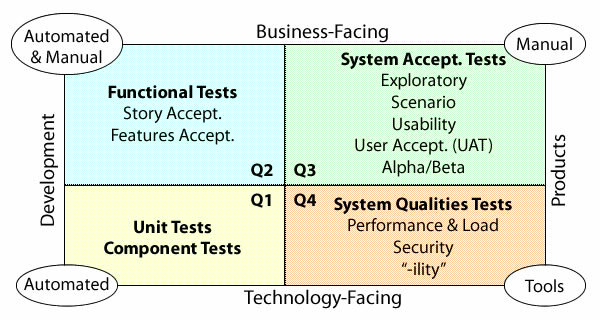 Besides the specific use of each criterion in deciding who’s to handle tests, and when, combining criteria brings additional answers regarding automation: product acceptance should be performed manually at business level, preferably by tools at system level; tests performed along development iterations can be fully automated for units and components (black-box), but only partially for functionalities (white-box). That tests classification can be used to distinguish between phased and iterative tests: the organization of tests targeting products and systems from business (Q3) or technology (Q4) perspectives is clearly not supposed to be affected by development models, phased or iterative, even if resources used during development may be reused. That’s not the case for the organization of the tests targeting functionalities (Q2) or components (Q1). Contrary to tests aiming at products and systems (Q3 and Q4), those performed on development artifacts cannot be set on fixed and well-defined specifications: being managed within iteration cycles they must deal with moving targets. They can be performed iteratively on software increments. They must take into account technical requirements. They must be aligned on the implementation of tested functionalities. 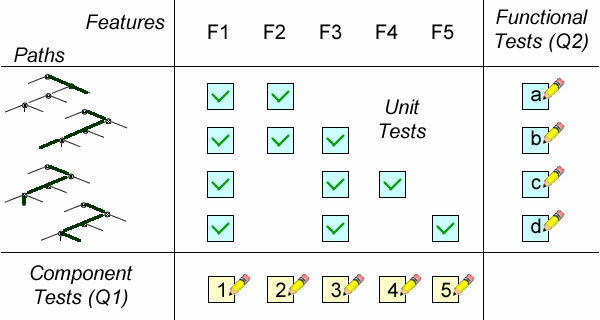 Iterative (aka development) tests for technical (Q1) and functional (Q2) requirements. Hence, if unit and component tests are to be performed iteratively, (1) they must be set against features and, (2) functional tests must be properly documented and available for reuse. They don’t have to take into account technical requirements. They must be aligned on business requirements (e.g users’ stories or use cases). 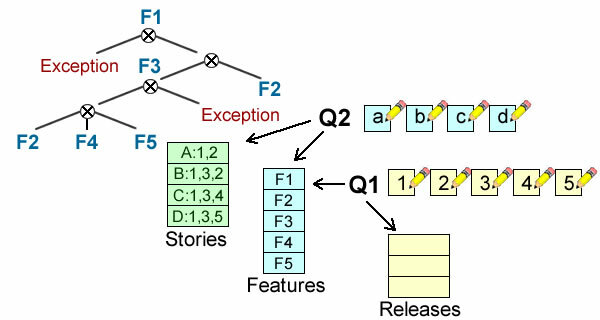 Assuming (see previous post) a set of stories (a,b,c,d) identified by alternative paths built from features (f1…5), functional tests (Q2) are to be defined and performed for each story, and then reused to test the implementation of associated features (Q1). 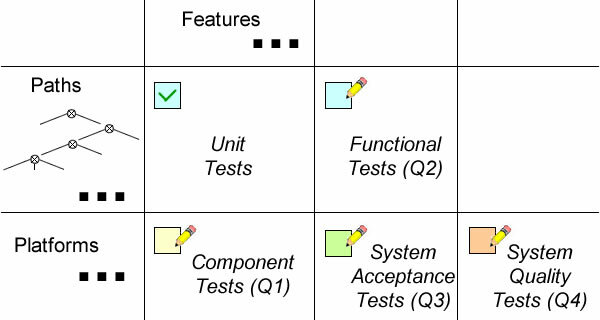 Functional tests are set along stories, units and components tests are set along features. Given that stories can be changed, expanded or refined along development iterations, how to manage the association between requirements and functional tests. Given that backlogs can be rearranged along development cycles according to changing priorities, how to update tests, manage traceability, and prevent regression. With model-driven approaches no longer available, one should consider a mirror alternative, namely test-driven development. Test driven development can be seen as a mirror image of model driven development, a somewhat logical consequence considering the limited role of models in agile approaches. Shared ownership: a project team groups users and developers and its first objective is to consolidate their respective concerns. Direct collaboration: decisions are taken by team members, without any organizational mediation or external interference. Collective responsibility: decisions about stories, priorities and refinements are negotiated between team members from both sides of the business/system (or users/developers) divide. Assuming those principles are effectively put to work, there seems to be little room for organized and persistent documentation, as users’ stories are meant to be developed, and products released, in continuity, and changes introduced as new stories. With such lean and just-in-time processes, documentation, if any, is by nature transient, falling short as a support of test plans and results, even when problems and corrections are formulated as stories and managed through backlogs. In such circumstances, without specifications or models available as development handrails, could that be achieved by tests ? Given the ephemeral nature of users’ stories, functional tests should take the lead. To begin with, users’ stories have to be reconsidered. The distinction between functional tests on one hand, unit and component tests on the other hand, reflects the divide between business and technical concerns. 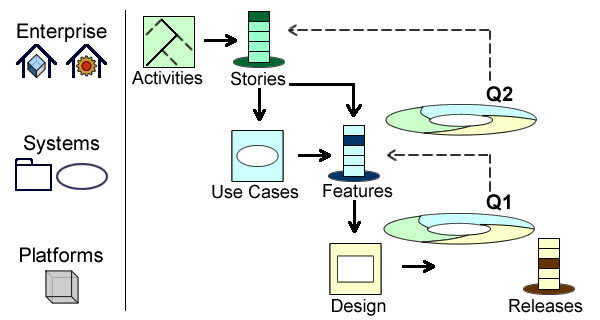 While those concerns may be mixed in users’ stories, they are progressively set apart along iteration cycles. It means that users’ stories are, by nature, transitory, and as a consequence cannot be used to support tests management. The case for features is different. While they cannot be fully defined up-front, features are not transient: being shared by different stories and bound to system functionalities they are supposed to provide some continuity. Likewise, notwithstanding their changing contents, users’ stories should be soundly identified by solution paths across problems space. Paths and Features can be identified consistently along iteration cycles. Unit tests are specified from crosses between solution paths (described by stories or scenarii) and features. Functional tests are defined by solution paths and built from unit tests associated to the corresponding features. Component tests are defined by features and built by the consolidation of unit tests defined for each targeted feature according to technical constraints. The margins support continuous and consistent identification of functional and component tests whose contents can be extended or updated through changes made to unit tests. 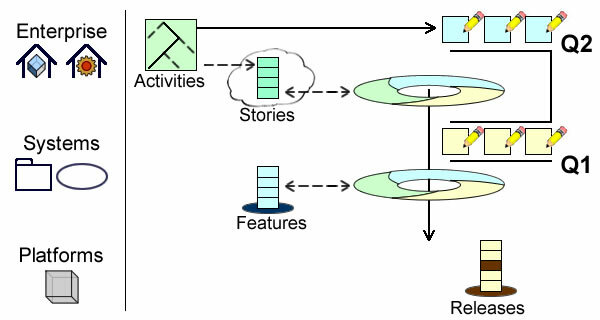 One step further, and tests can even be used to drive iteration cycles: once features and solution paths soundly identified, there is no need to swell backlogs with detailed stories whose shelf life will be limited. Instead, development processes would get leaner if extensions and refinements could be directly expressed as unit tests. System Quality Tests deal with performances and resources from the system management perspective. As such they will combine component and functional tests in operational configurations without taking into account their business contents. System Acceptance Tests deal with the quality of service from the business process perspective. As such they will perform functional tests in operational configurations taking into account business contents and users’ experience. Development Tests are to be consolidated into Product and System Acceptance Tests. Requirements set too early and quality checks performed too late are at the root of phased processes predicaments, and that can be fixed with a two-pronged policy: a preemptive policy based upon a requirements taxonomy organizing problem spaces according concerns business value, system functionalities, components designs, platforms configuration; a corrective policy driven by the exploration of solution paths, with developments and releases driven by quality concerns. Development or unit tests are defined at platform level and applied to software components. Integration or system tests are defined at system level and built from tested components. Acceptance tests are defined at enterprise level and built from tested functionalities. On a broader perspective such a framework is to provide the foundation of enterprise architecture workflows. Reusing artifacts means using them in contexts that are different of their native ones. That may come by design, when specifications can anticipate on shared concerns, or as an afterthought, when initially unexpected similarities are identified later on. Cost benefits are most easily achieved for component engineering but may also be obtained upstream with model reuse and patterns. Quality benefits are first and foremost rooted at model level, especially when components implementation is supported by automated tools. Continuity benefits are to be found both along the business (semantics and business rules) and engineering (functional architecture and platform implementations) perspectives. Reuse policies may also bring positive externalities by inducing a comprehensive approach to software design. Artifacts designed for reuse are usually most costly to develop, even if part of additional costs should be ascribed to quality management. Excessive enforcement policies may significantly hamper projects ability to meet business needs in time. Managing reusable assets usually induces overheads. 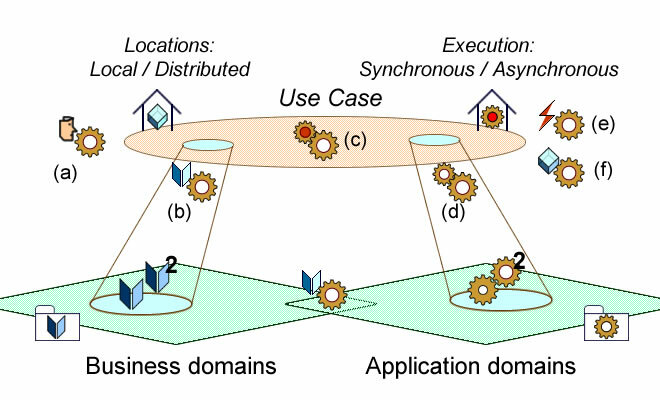 Business perspective: how to factor out and reuse artifacts associated with the knowledge of business domains when system functionalities or platforms are modified. Engineering perspective: how to reuse development artifacts when business contents or system platforms are modified. Architecture perspective: how to use system components independently of changes affecting business contents or development artifacts. That can be achieved by managing development assets along model driven architecture: CIMs for business and enterprise architecture, PIMs for systems functional architecture, and PSMs for systems technical architecture. Whatever their inception, reused artifacts are meant to be used independently of their native context and concerns: opportunistic reuse will map a specific purpose to another one, planned reuse will map a shared concern to a specific purpose. As a corollary, reuse policies must be supported by some traceability mechanism linking concerns and purposes across contexts and architectures. The simplest solution is to reuse generic components, with the business knowledge directly transferred through parameters. Similarly, business rules can be separately edited and managed in business contexts before being executed by system components. 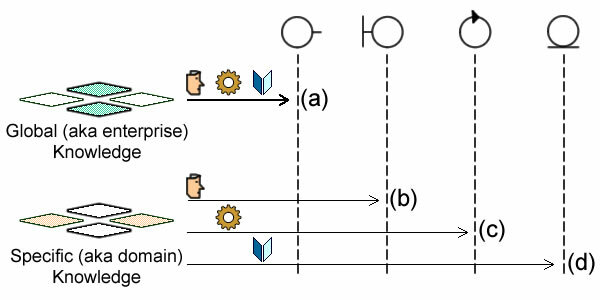 One step further, business semantics and rules can be fenced off with domains and applied to different objects and applications. Finally, models of business objects and processes can be capitalized and managed as reusable assets. System functionalities: functional patterns are (re)used to map functional requirements to functional architecture, and services are (re)used to support business processes. Software architecture: Object and aspect oriented designs, using inheritance and polymorphism. Software implementations: Component-based development and information hiding. Along the architecture perspective information hiding is generalized to systems, and reuse is masked by the definition of services. It must be noted that, contrary to misleading similarities, refactoring is the opposite of reuse: instead of building from well understood and safe artifacts, it tries to extract some reusable chunks from opaque and unsafe components. Domain specific knowledge are rooted at requirements level. That’s typically achieved when use cases are introduced to describe how systems are meant to support business processes. With different use cases targeting different aspects of the same business objects and processes, overlaps must be identified and factored out in order to be reused across processes. Business knowledge may also be global, i.e shared at enterprise architecture level, defining objectives, assets and organization associated with the continuity of corporate identity and business capabilities within a regulatory and market environment. 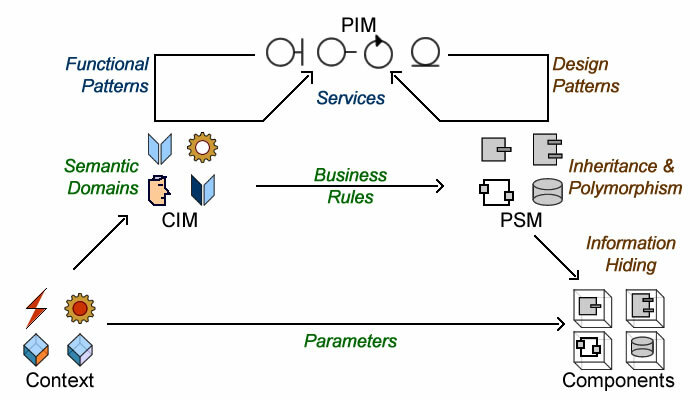 In any case, the challenge is to map business knowledge to system models, more precisely to embed reused descriptions of business objects and process to corresponding development artifacts. At architecture level the mapping should target objects or processes identities, at domain level the focus will be on aspects and views. 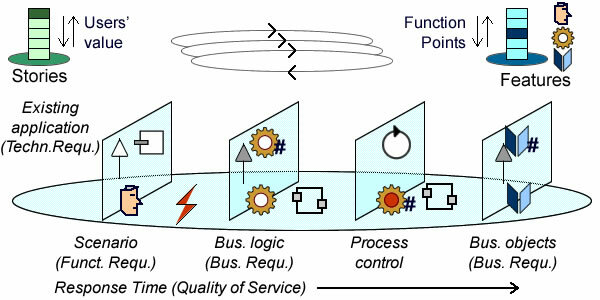 As epitomized by service oriented architectures, business architectures can be mapped to system ones through delegation, either directly (business processes calling on services), or indirectly (collaboration between services). That will establish a clear distinction between shared (aka global) and domain specific knowledge, and consequently between respective economics of reuse. Given that shared knowledge must be reused across domains and applications, there can be no argument about benefits. That will be achieved by a messaging model built on a need-to-know basis. And since such model is an intrinsic feature of the functional architecture, it incurs no additional overheads. Specific knowledge for its part is managed at domain level and therefore masked behind services interfaces. Whatever reuse occurs there remains local and an intrinsic part of domain design. 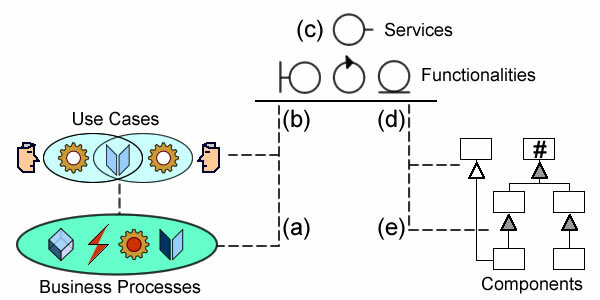 Knowledge Reuse through services (a), boundaries (b), controls (c), and entities (d). Things are not so clear when business knowledge is not managed by services but distributed across domains, mixing specific and global knowledge. Managing reusable assets would be easy were the distinction between business and functional requirements to coincide with the one between shared and specific knowledge; unfortunately that’s seldom the case, and requirements, functional or business, will have to be sorted out at architecture or design level. Whereas Service Oriented Architectures (SOA) put functionalities in the driving seat, Enterprise Application Integration (EAI) gives the lead to applications for which it provides adapters. As maintenance of integration adapters is a very poor substitute for knowledge management, reuse is mostly limited to legacy applications. At design level knowledge is weaved into canonical data models (entities), functional architectures (controls), and user interfaces frameworks (boundaries). Mixed concerns: business requirements can be specific, functional ones can be global. On one hand, tracing reuse to requirements may be problematic as they are by nature concrete and unstructured, hence not the best support for generalization or the factoring out of shared features. Assuming business analysts can nonetheless separate reusable wheat from specific chaff, knowledge management at this level will require a dedicated framework supporting comprehensive and differentiated traceability. Additional overheads will have to be taken into account and compared to potential benefits. On the other hand, canonical data models and functional architectures are meant to provide unified views of shared objects and semantic domains. Yet, canonical models are by nature unwieldy as they carve structures, features, and connections of business objects, without clear mechanisms to combine shared and specific knowledge. As a corollary, their use may reduce flexibility, and their management usually induces significant overheads. Repository delusion: knowledge being by nature contextual, its reuse is driven by circumstances and purposes; as a consequence the availability of large repositories of development assets will probably be ignored without clear pointers rooted in contexts and concerns. Confusion between components (or structures) and functionalities (or interfaces): under the influence of the object oriented paradigm, the distinction between objects and aspects is all too often forgotten. That’s unfortunate as this difference is congruent with the one between business objects on one hand, business operations on the other hand. 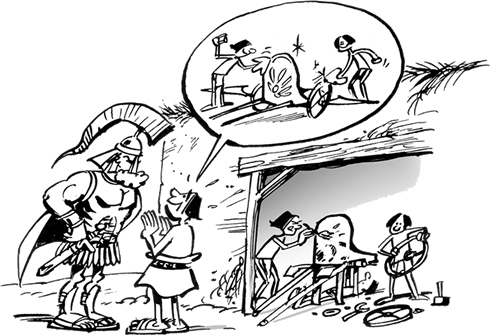 Over generalization: reuse is usually achieved by factoring out useful aspects or factoring off useless ones. In both cases the temptation is to repeat the operation until nothing could be added to the scope. Such “flight for abstraction” will inevitably overtake the proper level of reuse and begets models void of any anchor to business relevancy. Scalability: while reuse is about separation of concerns and complexity management, those two criteria don’t have to pull in the same direction. When they don’t, variants will be dispersed across artifacts and their processing will suffer a combinatorial explosion if the system has to be scaled up. Obsolescence: shelf lives of development assets can be defined by each or both business or technical relevancy. Assuming spans either coincide or are managed independently, they should be explicitly taken into account before any reuse. Provide some built-in traceability mechanisms between knowledge and artifacts. Support the distinction between objects and aspects and differentiated inheritance. Sorting out reuse concerns with differentiated inheritance. Sustainable system development is the ability to meet present business requirements while enhancing system capability to support future ones. Clearly reuse is not the only factor of sustainability, with architectures, returns, and risk management being pivotal. 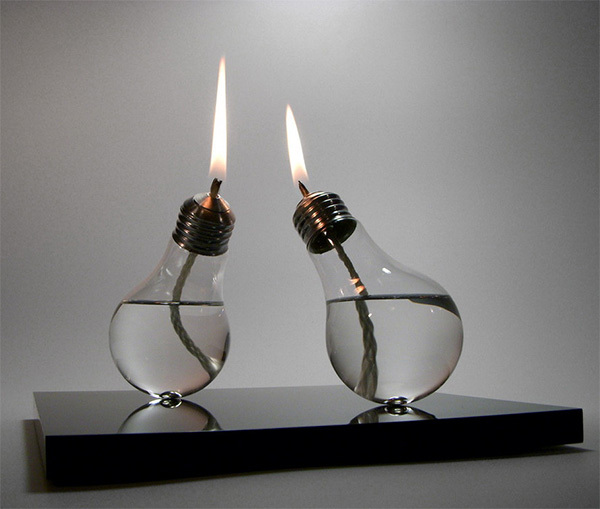 But the economics of reuse encompass most of other factors. Reuse of development assets rooted in enterprise architecture is not an option: system functionalities are meant to support business processes as they are (a). At the other end of the development process, reuse of software designs and components across technical architectures should bring benefits in quality and costs (c). In between reuse of system functionalities is necessary to guarantee the robustness and continuity of functional architectures; it should also leverage the benefits of reuse of enterprise and development assets (b). Regarding business assets, a clear distinction must be maintained between specific and shared knowledge, reuse being considered for the latter only. Regarding the reuse of business assets as functional ones, services clearly offer the best returns. Otherwise costs/benefits are to be assessed, from reuse of vocabulary and semantics domains (straightforward, limited overheads), to canonical models and enterprise application integration (contingent, significant overheads). Economics of reuse will ultimately be set by traceability mechanisms linking enterprise and business knowledge on one hand, components designs on the other hand. Even for services (c), if at a lesser degree, the business case for reuse will be decided by leveraged benefits and non cumulative costs. 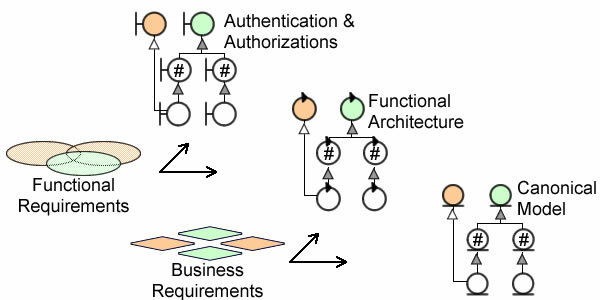 Hence the importance of maintaining the distinction between identified structures and associated aspects from business (a) and functional (b) requirements, to components interfaces (d) and structures (e). 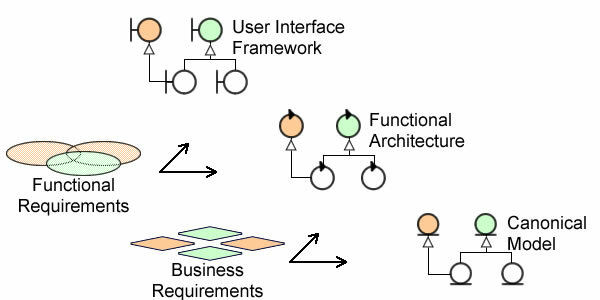 Maintaining the distinction between structures and aspects from business (a) and functional (b) requirements, to components interfaces (d) and structures (e). Changes in business contexts can usually occurs along two frequency waves: short, for market opportunities, and long, for an organization’s continuity. Associated risks could be better managed if corresponding knowledge were managed accordingly. System architectures are meant to evolve in synch with organization continuity; were technological environment or corporate structures subject to unexpected changes, reusable functional assets would be of great help. Given that enterprise IT can no longer be self-contained and operate in isolation, reusable designs may provide buffers to technological risks and help exploiting unexpected business opportunities. Contrary to some unfortunate misconceptions, measurements are as much about collaboration and trust as they are about rewards or sanctions. By shedding light on objectives and pitfalls they prevent prejudiced assumptions and defensive behaviors; by setting explicit quality and acceptance criteria they help to align respective expectations and commitments. Since projects begin with requirements, decisions about targeted functionalities and resources commitments are necessarily based upon estimations made at inception. Yet at such an early stage very little is known about the size and complexity of the components to be developed. Nonetheless, quality planning all along the engineered process is to be seriously undermined if not grounded in requirements as expressed by stakeholders and users. Contracts without transparency are worthless, and the first objective is therefore to track down complexity across enterprise architecture and business processes. For that purpose one should distinguish between business and application domains, business processes, and use cases, which describe how system functionalities support business processes. 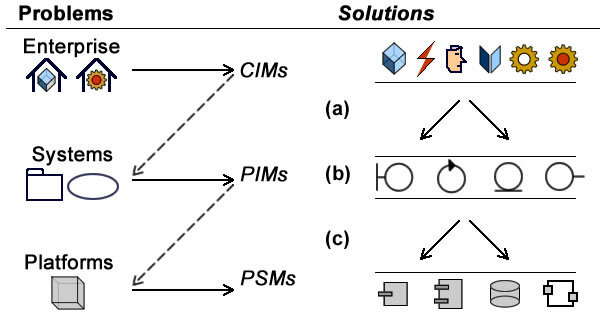 Based upon intrinsic metrics computed at domain level, functional metrics are introduced to measure system functionalities supporting business processes and compare alternatives solutions. Finally requirements metrics should also provide a yardstick to assess development models. The footprint includes artifacts for symbolic objects and activities, partitions (objects classifications or activities variants). 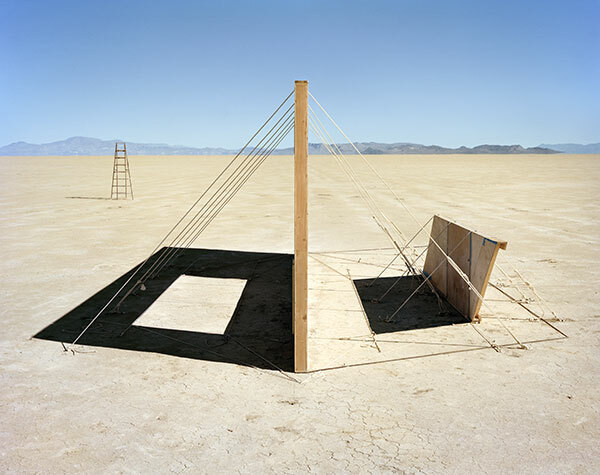 Symbolic objects and activities are qualified as primary or secondary depending on their identification. The reliability of the footprint is weighted by the explicit qualification of artifacts as primary or secondary. Symbolic representations for objects and activities are associated with features (attributes or operations) defined within semantic domains. A part from absolute measurements a number of basic ratios can be computed for anchors (primary objects and activities) and associated partitions. Percentage of artifacts with undefined identification mechanism. Percentage of partitions with undefined characteristics (exclusivity, changeability). Average number of artifacts and partitions by domain (a). It must be noted that whereas those ratios do not depend of any modeling method, they can nonetheless be used to assess requirements or refactor them according specific methods, patterns, or practices. The footprint of supporting functionalities is marked out by roles to be supported, active physical objects to be interfaced, events to be managed, and processes to be executed. As for symbolic representations, corresponding artifacts are to be qualified as primary or secondary depending on their identification, with accuracy and reliability of metrics weighted by the completeness of qualifications. Functional artifacts (objects, processes, events, and roles) are associated with anchors and features (attributes or operations) defined by business requirements. Additional adjustments are to be considered for distributed locations and synchronous execution. Average and maximum number of root use cases relative to business and application domains. Average and maximum number of root use cases relative to primary activities. Average and maximum number of secondary use cases relative to root ones. Average number of primary (for identified) and secondary roles relative to root use cases. Average number primary (aka external) and secondary (issued by use cases) events relative to root use cases. Average and maximum number of primary objects relative to use cases. The number of variants supported by a use case relative to the total associated with its footprint, respectively for persistent and transient objects. As noted above, requirements metrics are a means to a dual end, namely to set a price on developments and define corresponding acceptance criteria. Moreover, as far are business is concerned, change is the rule of the game. Hence, if many projects can be set on detailed and stable requirements, projects with overlapping concerns and outlying horizons will usually entail changing contexts and priorities. While the former can be contracted out for fixed prices, the latter should clearly allow some room for manoeuvre, and requirements metrics can help to manage that room. Assuming that projects are initiated from clearly identified business domains or processes, requirements capture should be set against a preliminary wire-frame referencing new or existing pivotal elements of business (1) and system (2) contexts. Those wire-frames (aka anchors, aka backbones) will be used both for circumscribing envelops and managing changes. 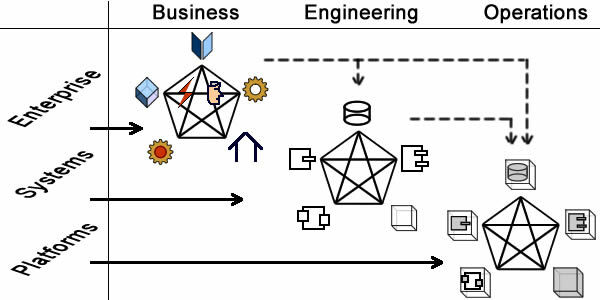 Envelops should be defined along architecture layers: enterprise for business objectives (1), functional for supporting systems (2), and technical for deployment platforms (3). That will set budgets outer limits for given architectural contexts. Moves within rooms (4) are governed by functional requirements and anchored to pivotal business objects or processed (wire-frame’s nodes) . Their estimations should take into account analogies with previous developments. Acceptance criteria could then be defined both for invariants (changes are not to overstep architectural constraints) and increments (added functionalities are properly implemented). Given that the business value of a story is often defined at process level, how to align it with its local assessment by project team. If problem spaces and solution paths are to be explored iteratively, how to reassess dynamically the stories in backlog. Answers to both questions are to be helped if requirements are qualified with regard to their nature and footprint. Informed decision making about what to consider and when clearly depend on the nature of stakes. Hence the importance of a reasoned requirements taxonomy setting apart business requirements, system functionalities, quality of service, and technical constraints on platform implementations. Architectural options, functional or technical, must be weighted by supported business features and quality of services. Dynamic ranking of users’ stories implies that their value can be mapped to features metrics at the corresponding level of granularity. That can be achieved with functional features assessed along architecture layers. Requirements should be assessed with regard to their nature and their footprint in functional architecture. Finally, requirements metrics may also be used to design quality checks to downstream models. With metrics for intrinsic characteristics of business domains on one hand, system functionalities on the other hand, subsequent models can be assessed for consistency, and alternatives solutions compared. The number of root packages models is to be compared to symbolic containers for business and application domains, and the sub packages to primary (#) objects or activities. The number of actors is to be set against the number of roles, with primary (#) roles standing for identified agents. The number of root use cases is supposed to coincide with primary (#) activities and roles. 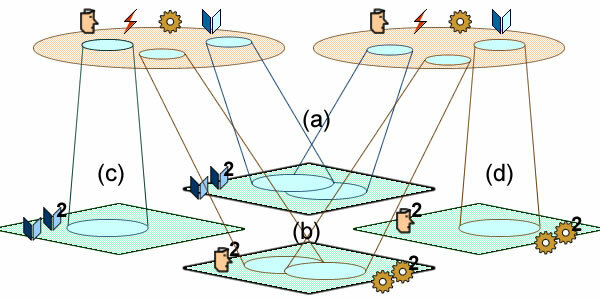 The number of structural inheritance hierarchies should be compatible with the number of frozen and exclusive partitions respectively for objects and activities.